Well, even though I should be working on my novel (which I’ve coined “TIVOC” for short), this is happening, because we need to subsist, after all. 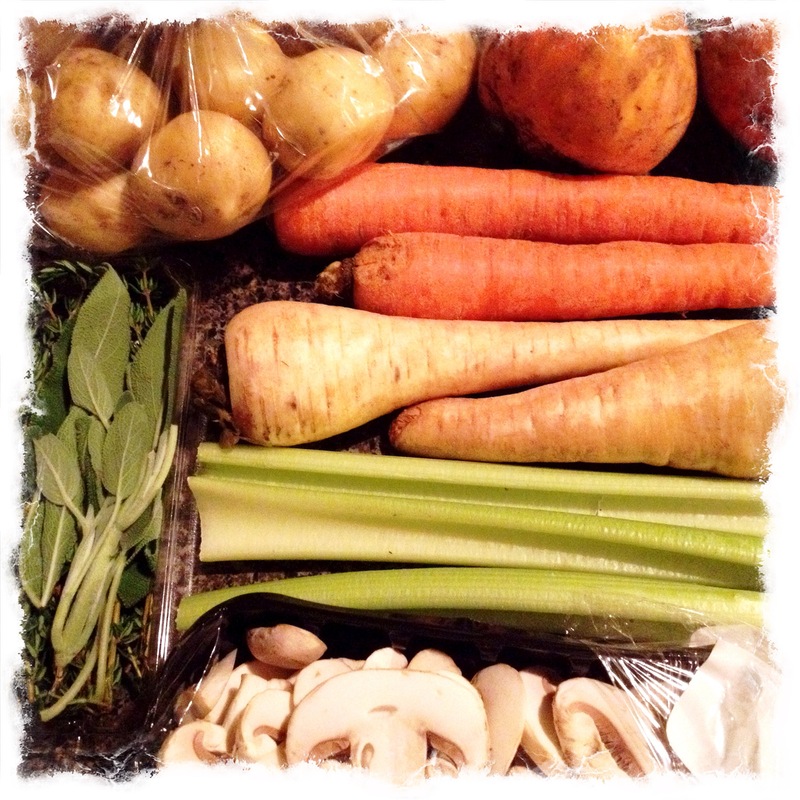 I’ll be taking this in to work this afternoon for dinner, along with some plain steamed rice. Combine oil with next 5 ingredients in a bowl and toss cauliflower. Lay out on a covered cookie sheet (I used foil but you can use parchment or a silicone mat) and sprinkle with salt and pepper. I have been personally favouring Maison Orphée grey sea salt lately. Bake in oven until nicely golden brown, turning occasionally. Every oven is different so just keep an eye on it. Half and hour should be plenty. 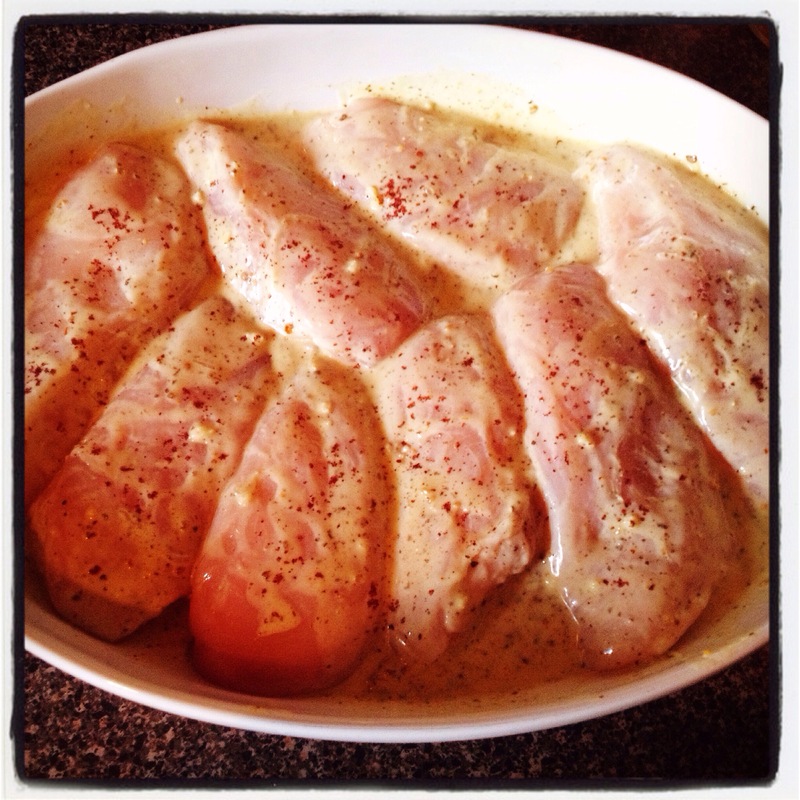 Place meat in baking dish. Add glug of oil, glug of white wine (I use whatever white wine I have open and on hand), lemon juice and zest. 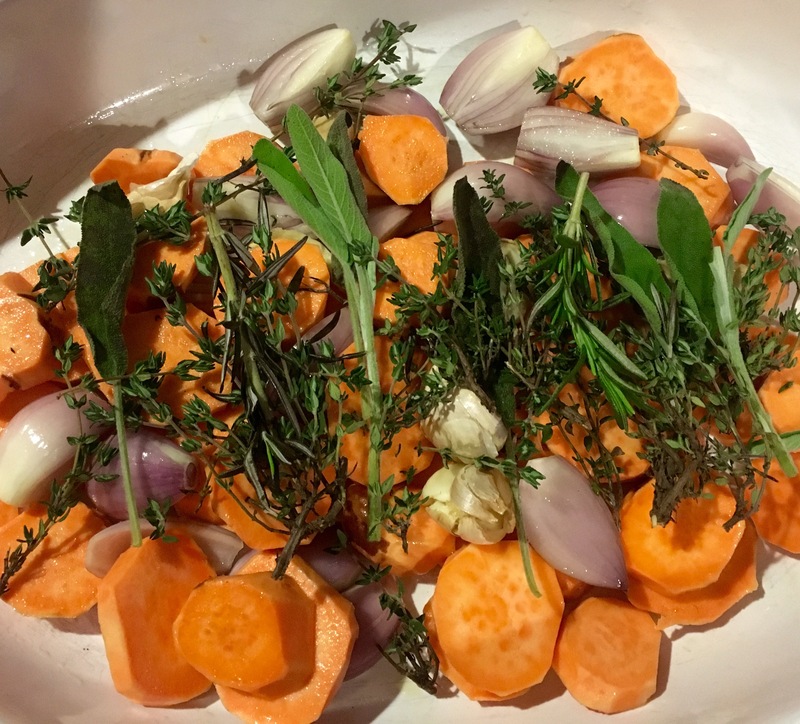 Sprinkle with garlic (I usually just press the cloves right on top with a garlic press) and summer savory (I got my tin from Pomme, a specialty store in Coquitlam – it’s a bit hard to find in regular grocery stores). Sprinkle with salt to taste (again, I used the sel gris) and bake until done. 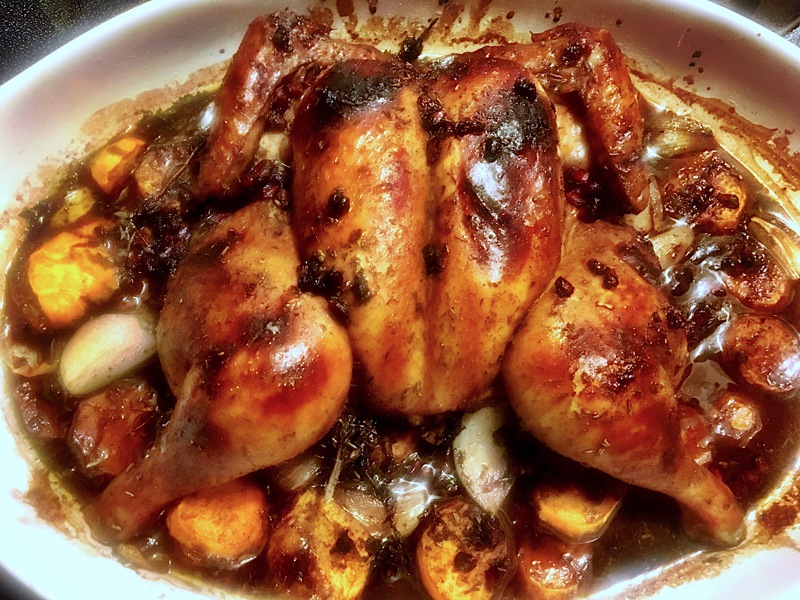 Follow safety guidelines for cooking poultry per weight and type. The liquids keep things moist so if you err on the side of longer cooking times (like I usually do – I left mine in for 50 minutes), it keeps things from drying out. I end up shredding the whole lot into the remaining liquid and using it to top the rice. 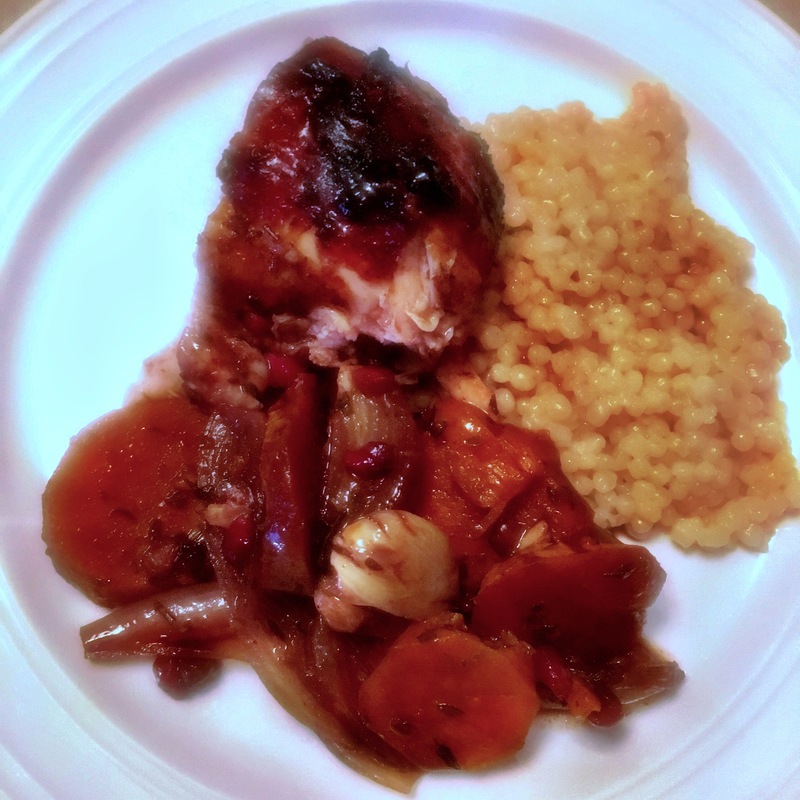 This entry was posted in from my kitchen, I MADE THIS, LIVING OUT LOUD and tagged cauliflower, cooking at home, recipes, turkey on 10 . April . 2018 by theartsyfartsychick. 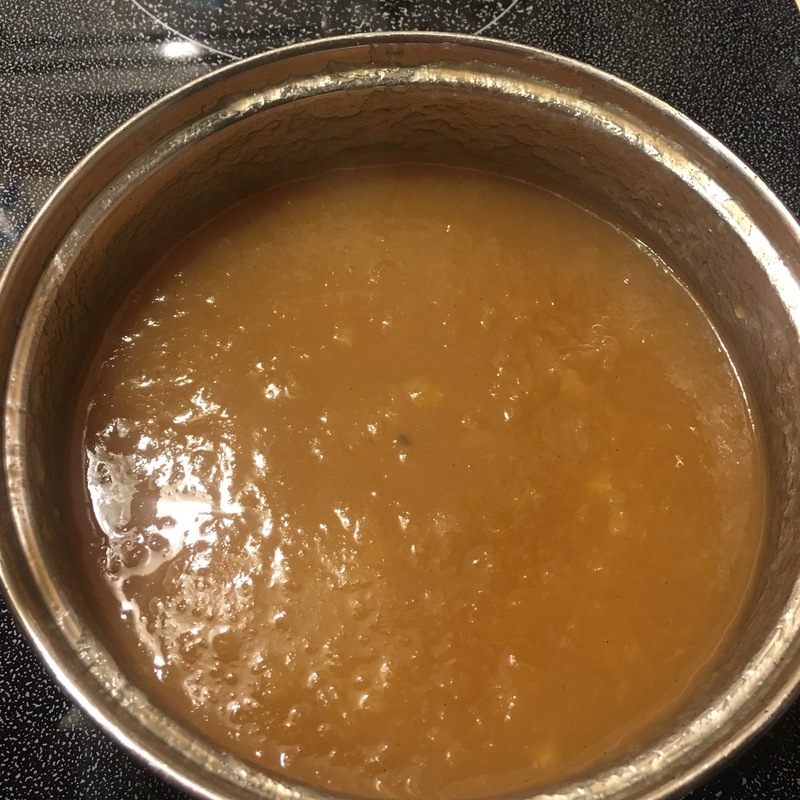 About 7 peeled and cored Spartans cubed small and covered with water just barely with a squeeze of a half lemon, a whole long cinnamon stick snapped in half, some sugar, a quarter vanilla bean, two whole cloves simmered until .. well, it’s a sauce. 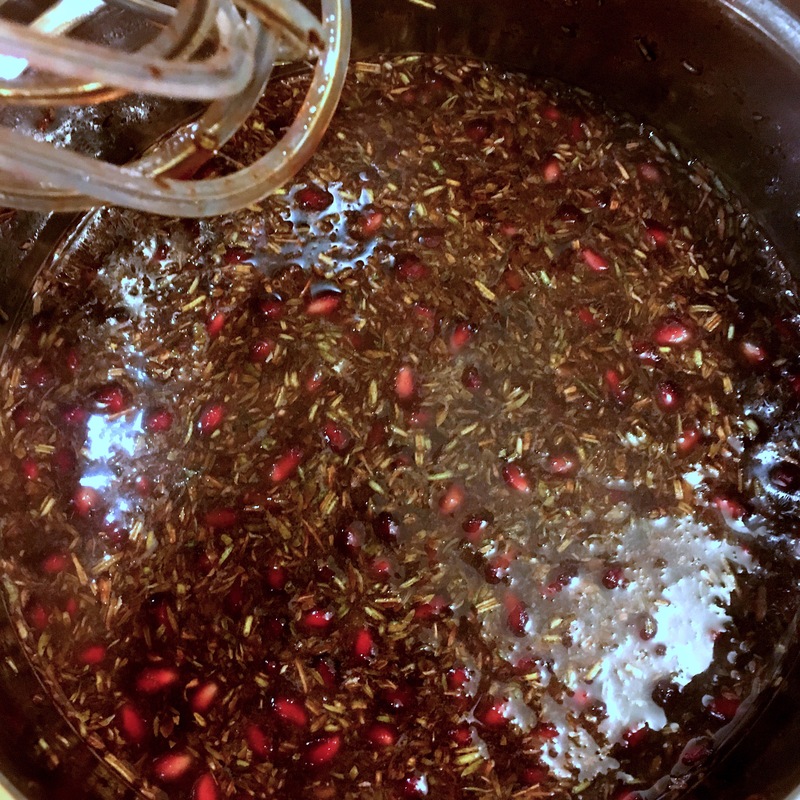 Add a capful of brandy and stir in with a bit more cane sugar until the alcohol evaporates and .. ::swoon::! 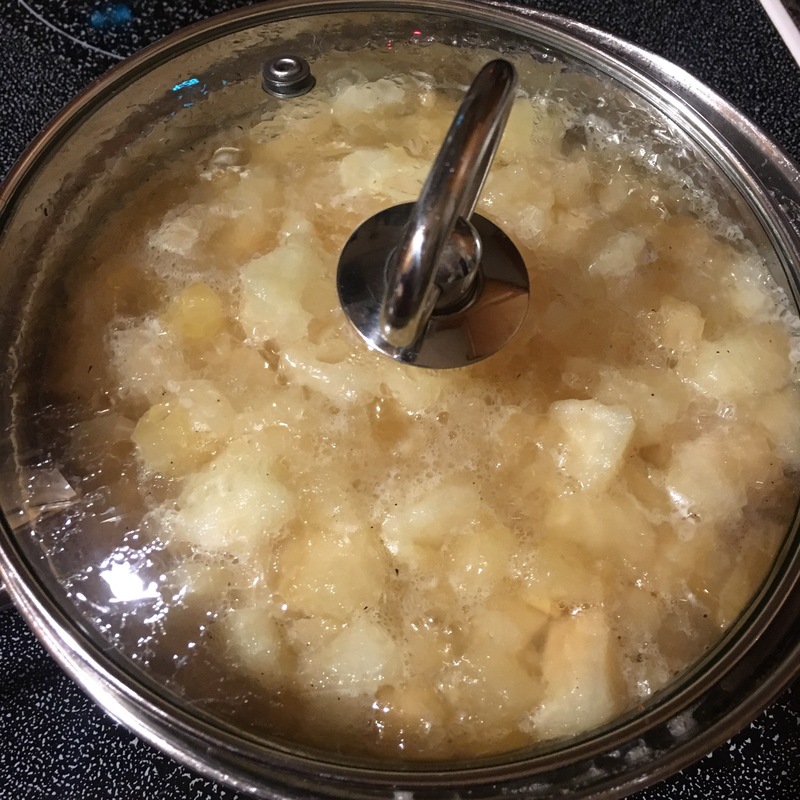 This entry was posted in from my kitchen, I MADE THIS and tagged apple sauce, recipes on 3 . December . 2016 by theartsyfartsychick. I had a wonderful visit with friends last night. I only just remembered to snap a pic of the main course and unfortunately, the photo is a little fuzzy. We started off with fresh baguette slices topped with Chevrai honey vanilla goat cheese, smoked salmon slivers, mango salsa and a drizzle of Bees Knees spicy honey. The salsa was made with 2 mangos, 2 small shallots, 3/4 red bell pepper, all finely diced, a squeeze of 1/2 a lime, salt and pepper to taste (I’ve been using Le Saunier de Camargue fleur de sel and love it fiercely) all tossed together with a few finely chopped cilantro leaves. 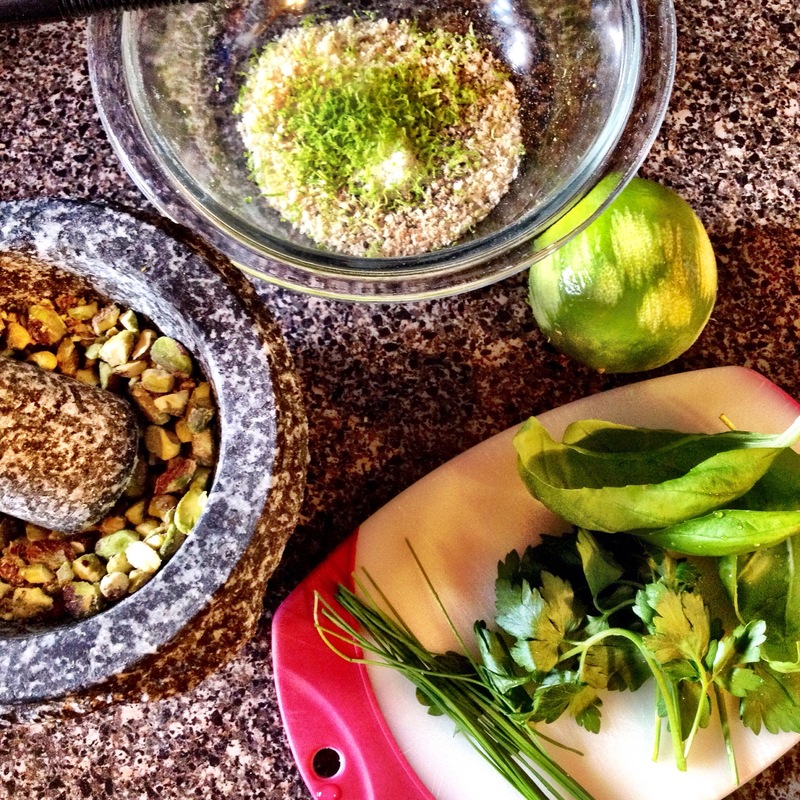 I personally love cilantro but some don’t seem to appreciate it as much, so I try to curb my enthusiasm a bit. I used maybe six leaves for mine. The main course was halibut en papilotte. 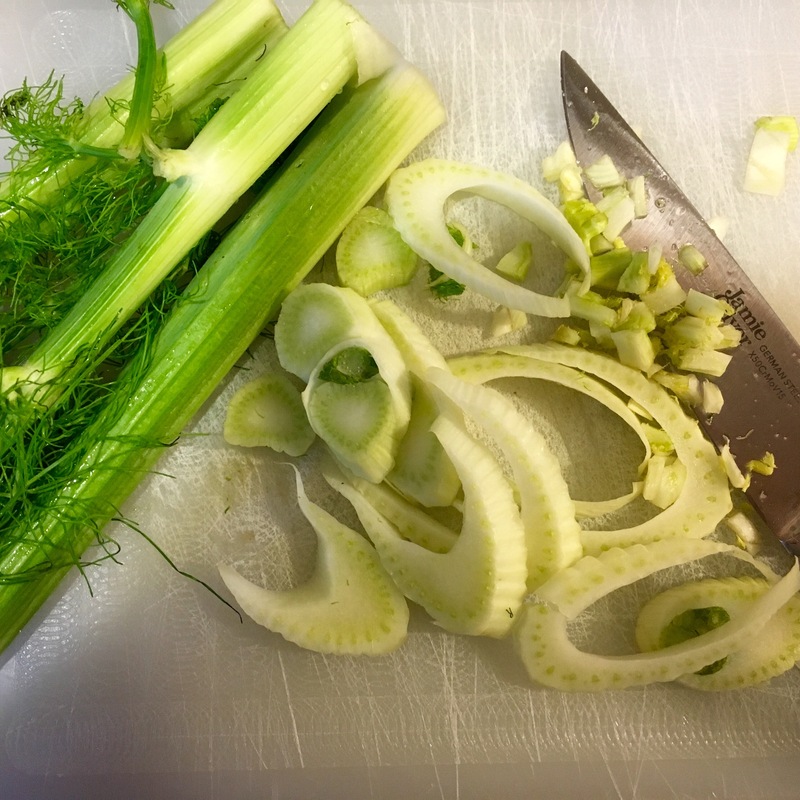 I put the halibut pieces over a layer of leek and fennel slivers (sliced using a mandolin), seasoned with salt and pepper, a drizzle of white wine and olive oil and garnished with lemon slivers which I’d fed through the mandolin as well. It was all wrapped up in parchment paper and cooked in the oven on a baking sheet at 425 for 18 minutes. I served them with fresh English peas using this recipe and a spring potato salad using this one. They did not disappoint. We cleansed our palates with some Mario’s gelatti lemon sorbet, and then I served up a rhubarb, Saskatoonberry and raspberry pie fresh from the oven. 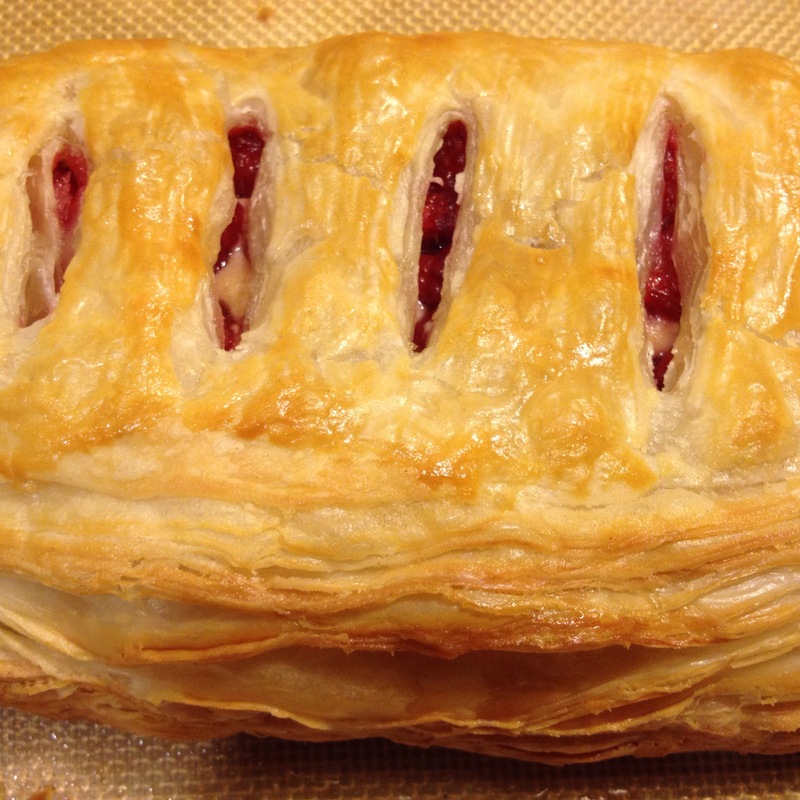 I cheated on the crust (I used the Pillsbury ready-made package) and the measurements were inexact on the fruit… about 5-7 stalks of rhubarb, cut into 1″ segments, a large tray of raspberries and about half a pound of Saskatoon berries. I grated the rind from 1 lemon and squeezed its juice in, added about 2 tablespoons of Madagascar vanilla bean paste, and about a cup and a half of sugar. Tossed the whole thing together to incorporate and baked it all in a double crust pie shell arrangement. The warm pie was served with a dollop of vanilla ice cream. We had some lovely Sauvignon Blanc from New Zealand as accompaniment, trying both the Matua from Hawke’s Bay and the Kono from the Marlborogh region. I liked both but the Matua was truly something special. This entry was posted in from my kitchen, I MADE THIS, LIVING OUT LOUD, MY TENDER HUMAN JOURNEY on 10 . July . 2016 by theartsyfartsychick. Inspired by a scene I’d read in the book I’m reading, I wanted to poach some fish in wine and cream. 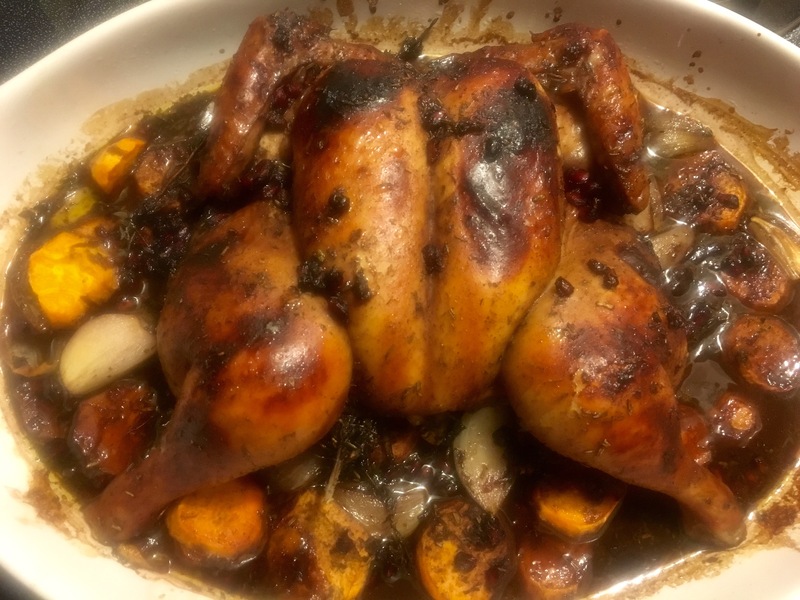 I didn’t have a recipe, and none of the ones I looked at were exactly what I wanted. So I improvised and concocted my own. 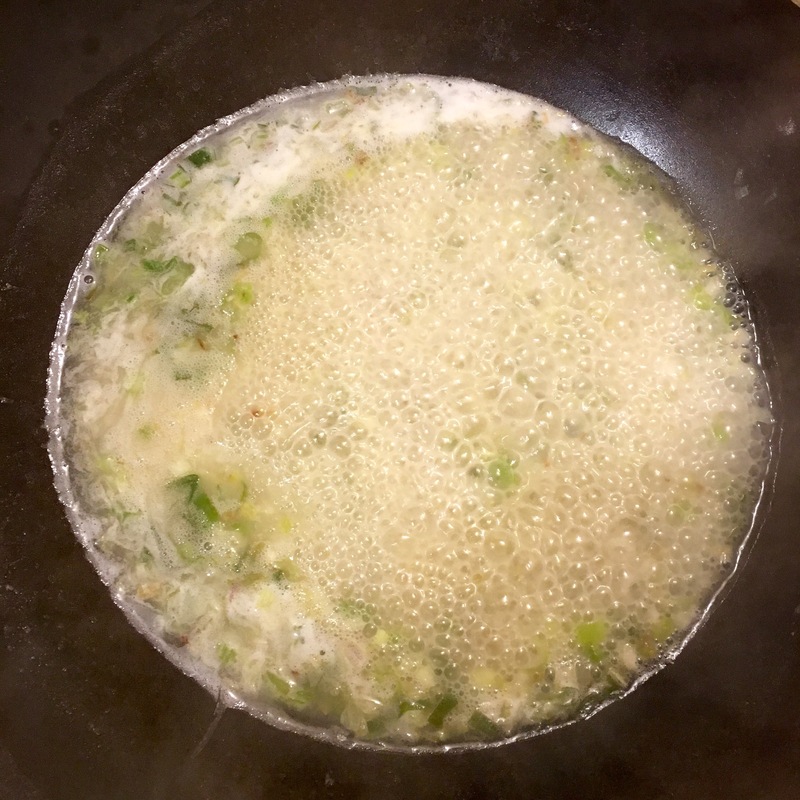 I finely chopped two large green onions and some fennel and cooked them over medium high heat in some heated grape seed oil and a dollop of butter. I added Maldon salt and freshly ground black pepper. After it was just on the edge of being caramelized, I added a sprinkling of flour and stirred for a few minutes to incorporate, and to also allow the raw taste of the flour to cook off. I then deglazed with 350ml of white wine. I used a sauvignon blanc from Chile. Once reduced, I added 200ml of cream and let it incorporate. I added pieces of fish to the pan and simmered for about 7 minutes, then transferred the fish into a dish warming in the oven. 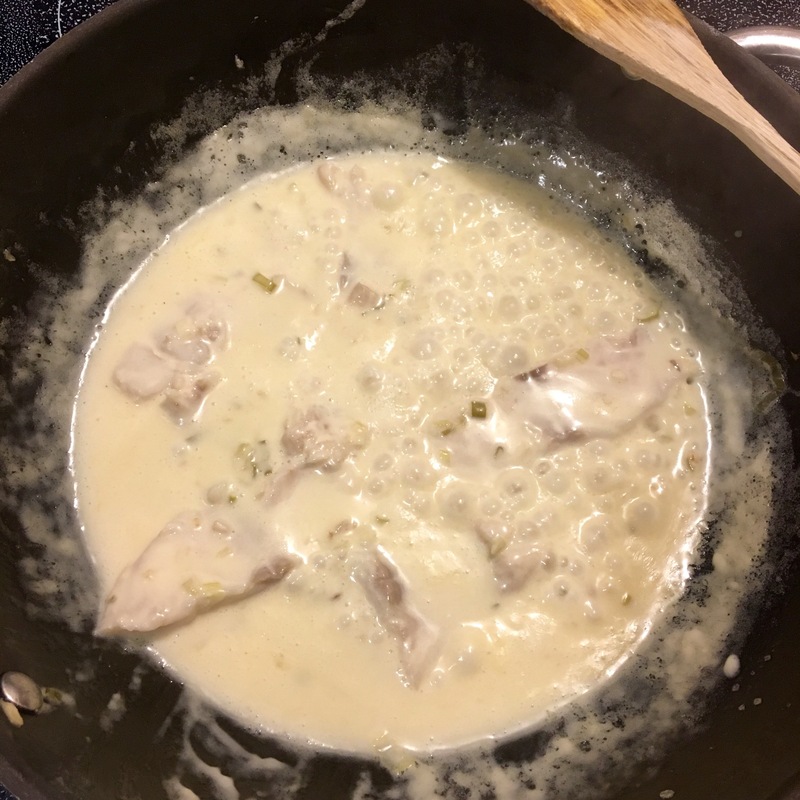 Once all the fish was cooked, I added the remainder of the 473ml carton of cream to the pan, grated in some lemon rind and added the leaves of a few sprigs of fresh thyme. 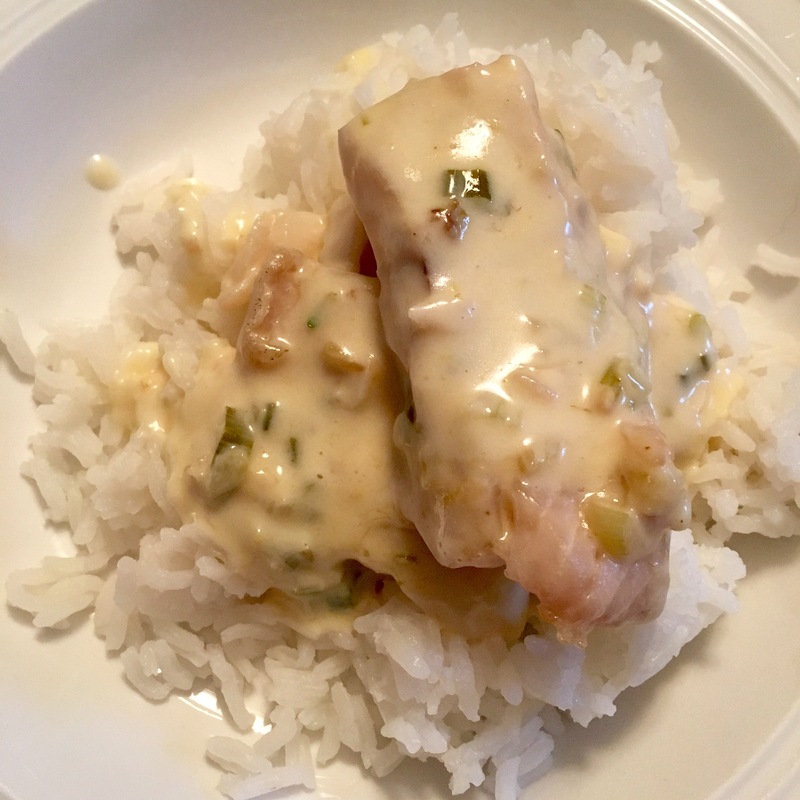 Once the flavours incorporated, I poured the sauce over the fish that had been warming in the oven. I served it over plain steamed jasmine rice. The consensus was that the dish was a win. This entry was posted in from my kitchen, I MADE THIS on 4 . July . 2016 by theartsyfartsychick. 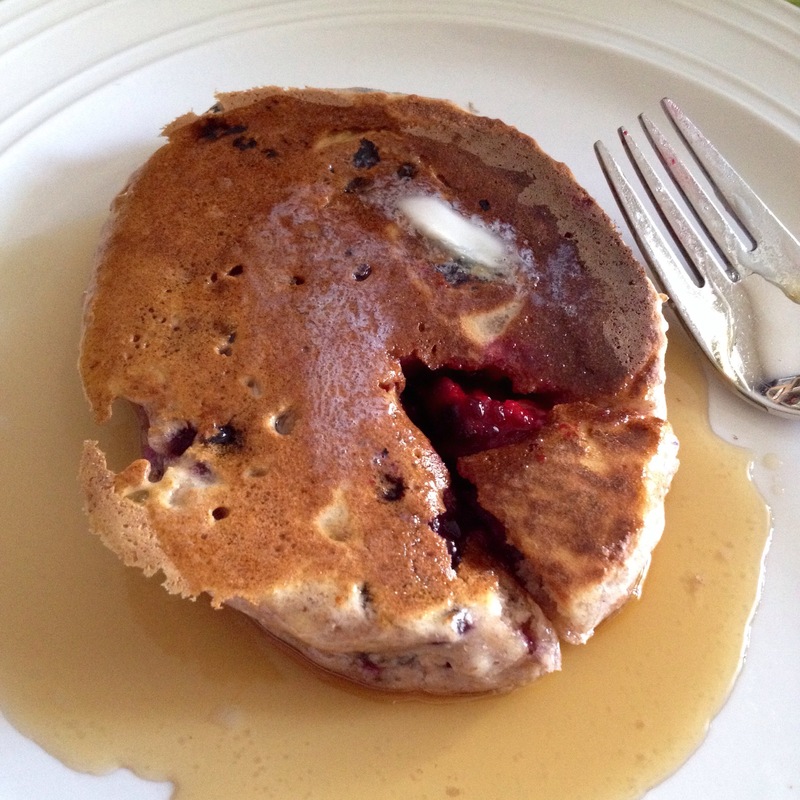 blackberry buttermilk pancakes with maple syrup… mmm…! This entry was posted in from my kitchen, I MADE THIS on 2 . August . 2015 by theartsyfartsychick. I am always surprised at how long the days are in the summer. 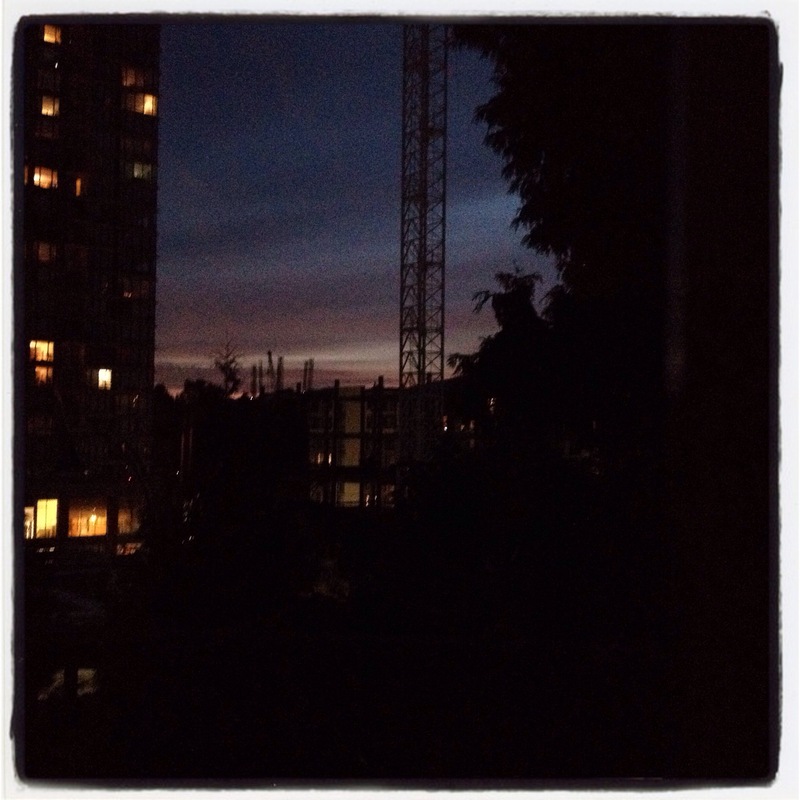 We are approaching the longest day and tonight, at 10:14pm, it was still this bright outside! We had a late dinner but the warm weather inspired me to create a refreshing dish. 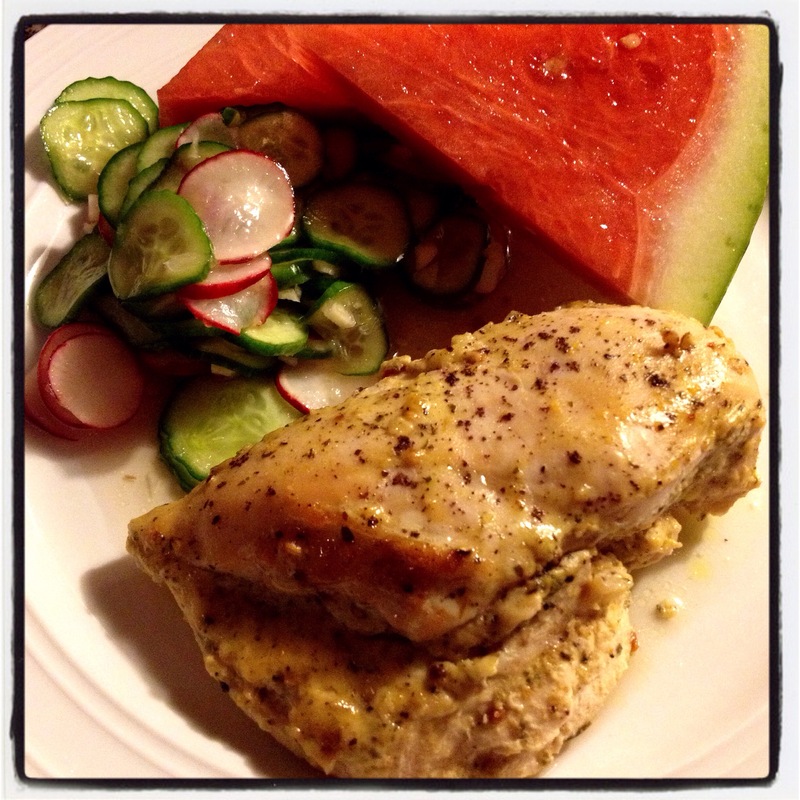 I baked some boneless, skinless chicken breasts in the oven, and fixed up a pickled cucumber, garlic and radish salad. I poured it over the chicken prior to popping the dish into the oven and let it bake for 50 minutes at 350F. The dressing for the salad was the juice of 1 lime, lots of honey and apple cider vinegar, whisked together with a wire whisk. I added a sprinkling of ground white pepper at the end. This is all to taste and the measurements arbitrary. The veggies were salted in the bowl separately, and I hand tossed them so they would be properly coated prior to starting to make the dressing. Once the dressing was applied and stirred in, it was covered and refrigerated until the rest of the meal was ready. Watermelon wedges rounded out the rest of the meal. This entry was posted in from my kitchen, I MADE THIS on 17 . June . 2015 by theartsyfartsychick. I’ve discovered the most delicious olive oil and balsamic vinegar. As with many things, skimping on quality often results in a less favourable eating experience, so it’s better to cough up a little extra and save the special things for their best use. I found a gorgeous extra virgin olive oil called Spiritu Santo at The Dirty Apron. I wanted to test out the smaller size before I went for the $21 half litre size and it doesn’t disappoint. 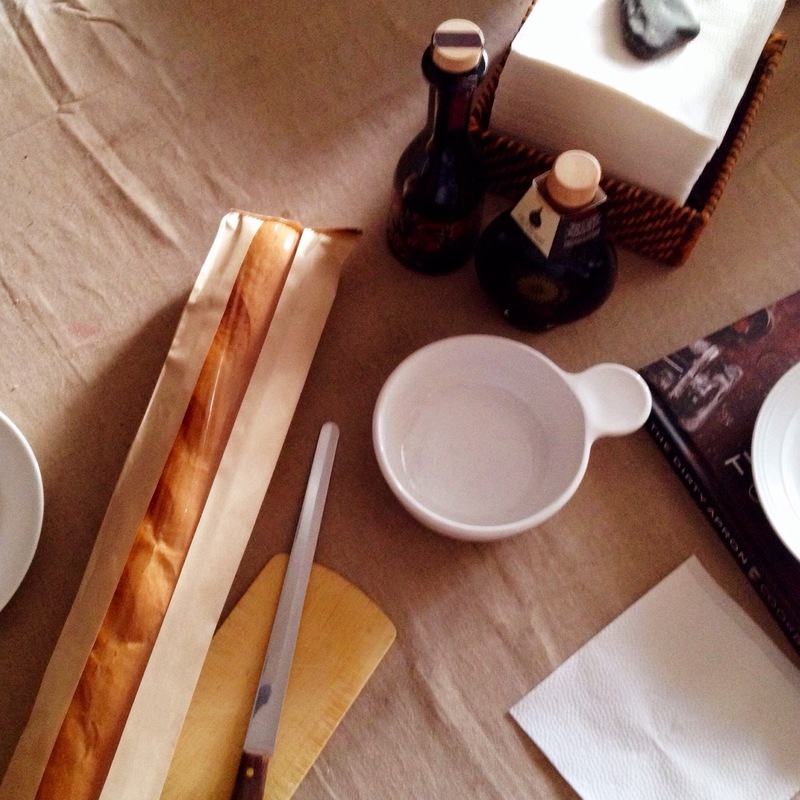 Poured into a bowl with some Due Vittorie balsamic vinegar (obtained at Thrifty Food – it was on sale last week for around $16 for 250ml), it was a perfect dipping combo for crusty baguette. Tonight we are having panko and herb crusted halibut filets, using a combined/adapted recipe from the Thrifty Foods site and the Dirty Apron cookbook. Since it’s an uncustomarily warm summery day, I opted to serve it with a bib lettuce salad and the avocado dressing that I made yesterday (from A Simple Feast cookbook by Diana Yen). 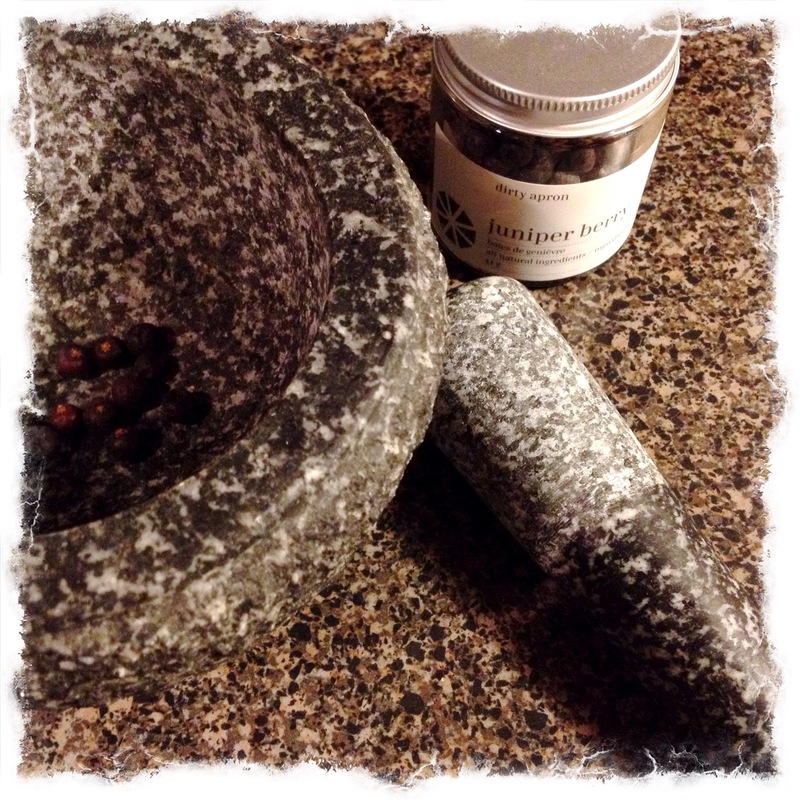 Grind pistachios into pieces (I used a mortar & pestle but you can use a rolling pin or a kitchen mallet too). Measure Panko and put into a medium sized bowl. 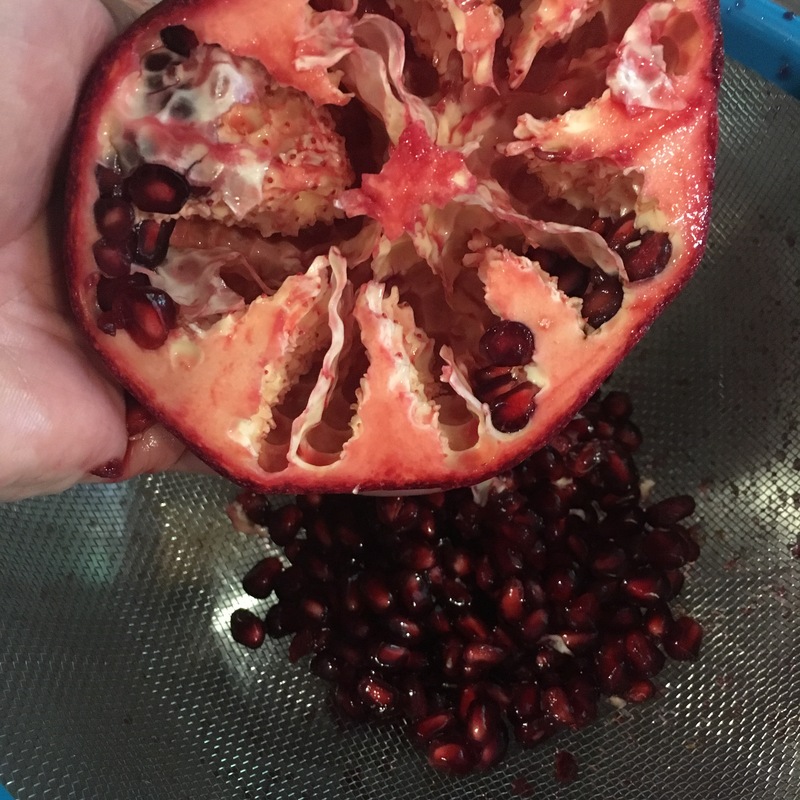 Combine ingredients 2-8 in bowl. 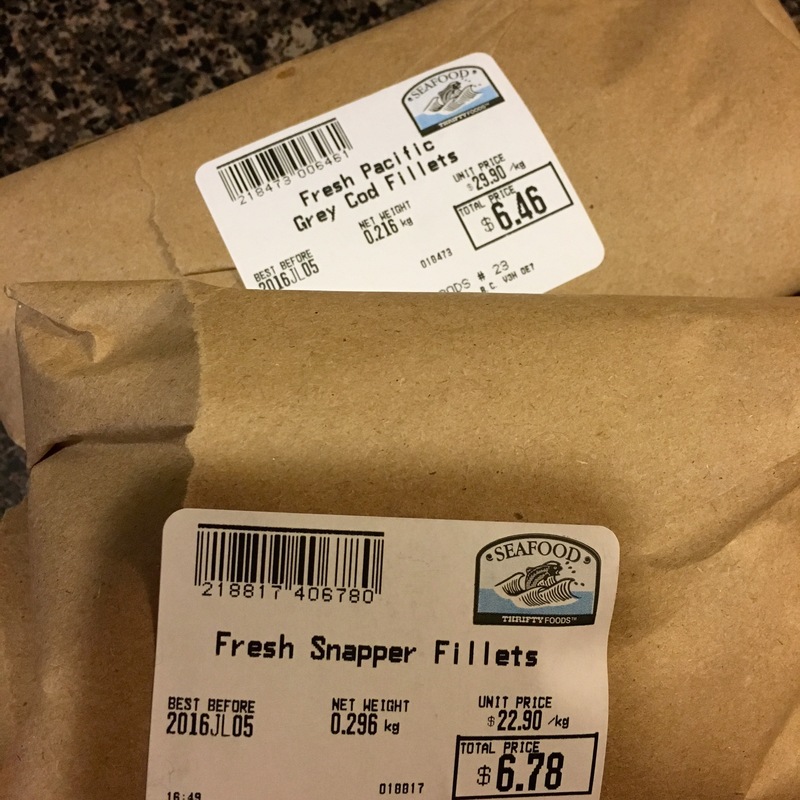 Rinse and pat dry halibut filets. Lay parchment sheet down in a baking dish. Coat one side of halibut filets with mayonnaise and lay mayonnaise side down into panko mixture. 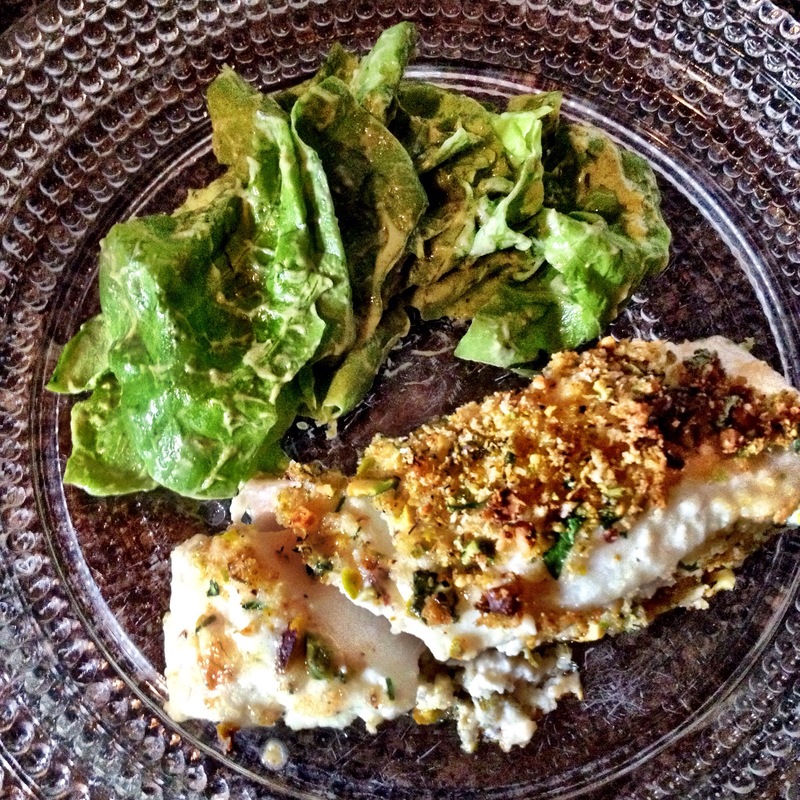 Place filets with panko coating down on parchment. 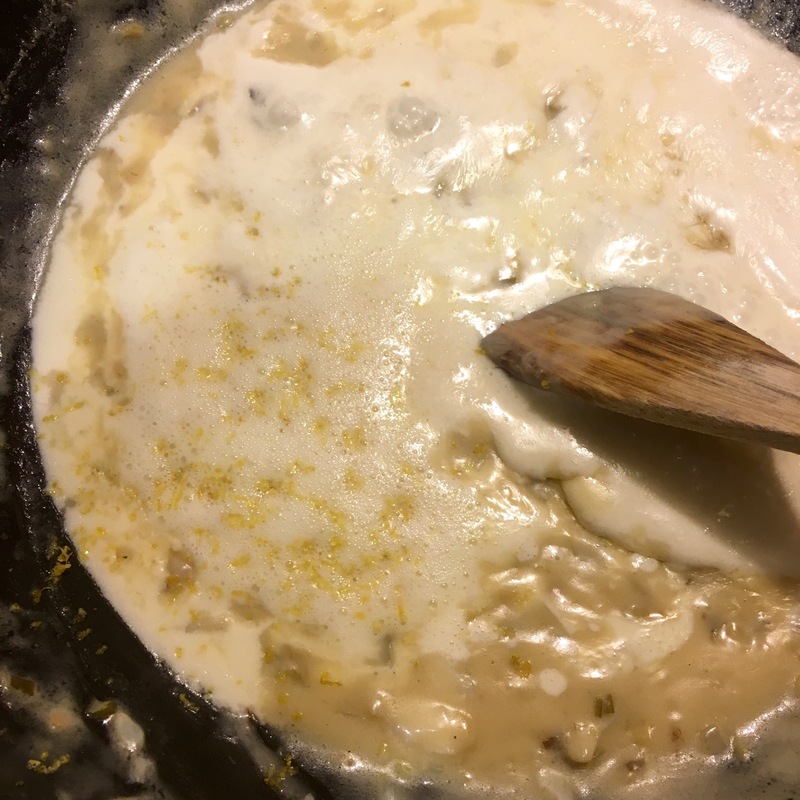 Smear additional mayonnaise on top of filets and top with remaining mixture – press it down on filets. Bake at 425F for 18-20 minutes. 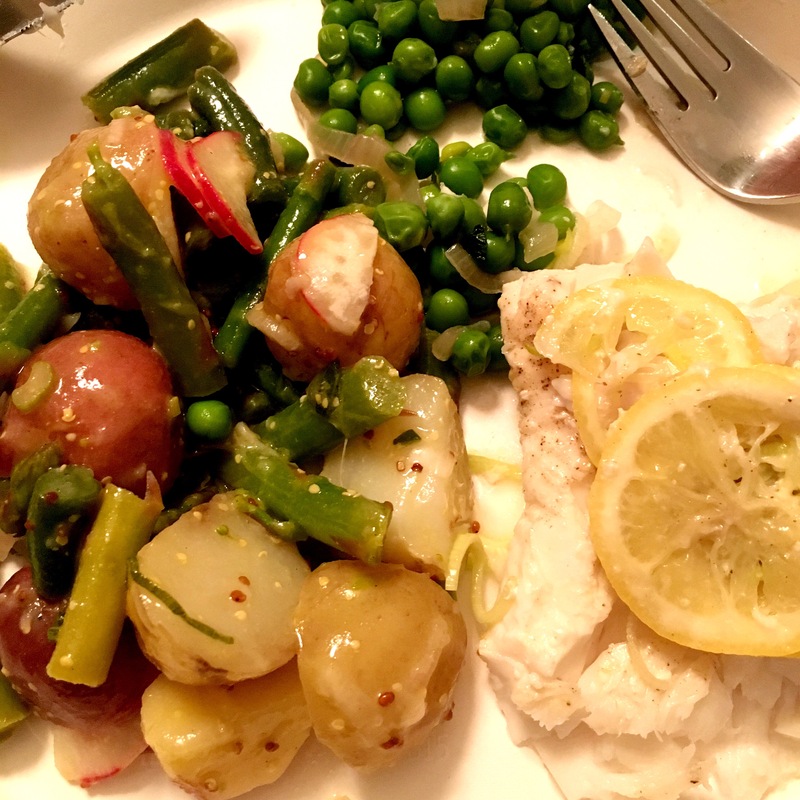 This entry was posted in from my kitchen, I MADE THIS, LIVING OUT LOUD and tagged A Simple Feast, avocado dressing, bib salad, David Robertson, Diana Yen, panko and herb encrusted halibut, the dirty apron on 15 . June . 2015 by theartsyfartsychick.